50% Off Soil Tests in September! September is one of the best times to pull soil samples for your farm or garden. And we'd like to help! Enjoy 50% off ALL soil tests! We know September is a busy month on the farm and soil testing for next season might be far from your mind, but we'd like to help make it worth your while! 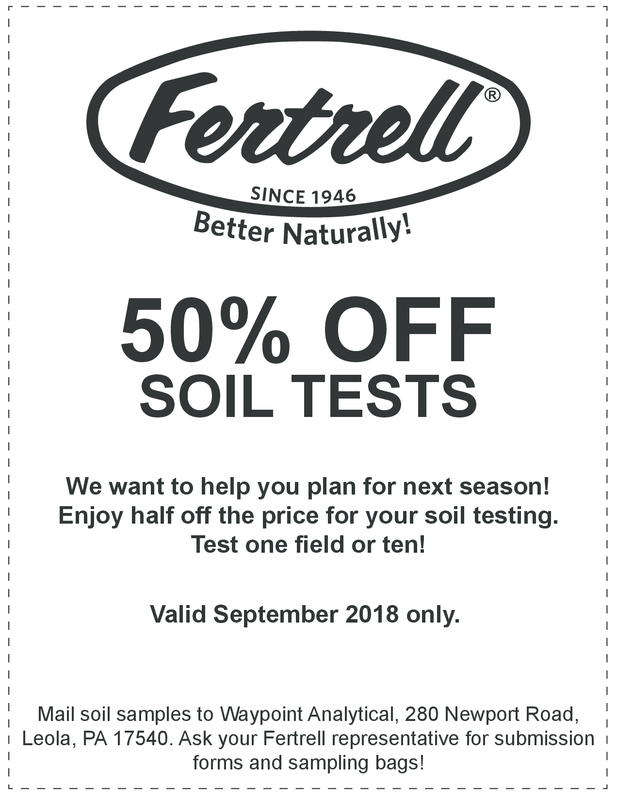 Throughout the month of September, enjoy a 50% discount on all soil tests submitted to Waypoint Analytical in Leola, PA with a Fertrell Submission Form. Submit one test or ten, the amount doesn't matter! Why use our soil tests instead of the free ones from university labs? Our tests include base saturation, pH, organic matter, and trace minerals. This gives our agronomy team all the information they need to give you the best recommendations for your fields. And remember, our recommendations and consultations are free - you just cover the cost of testing! Make sure to fill out all the highlighted information! If you need sample bags, send us an email and we'll mail them to you. Please note that you are responsible for taking your own samples. Fertrell employees are available locally (south-central PA only) to take samples for you at the cost of $10 per sample. Please contact our office if interested. Mail your samples and the submission form to Waypoint Analytical. Do NOT send payment with your samples. We will invoice you with the discounted price. The terms of the invoice are net 15 days. Additional Details: You do not need to submit the coupon above in order to receive the discount. No other discounts apply. Invoice may be paid with cash, check, or credit card (Visa, Mastercard and Discover only). Samples must be received at the lab by September 28, 2018 in order to receive the discount. Postmarked samples that have not been received and processed by the lab by September 28, 2018 do not qualify for the discount. Otherwise, it's time to start pulling soil samples! Make sure to tell your friends and neighbors about this great deal too! Remember, they don't need to be current Fertrell customers to get this discount - It's open to everyone! You received this email because you are subscribed to Marketing Information from The Fertrell Company .